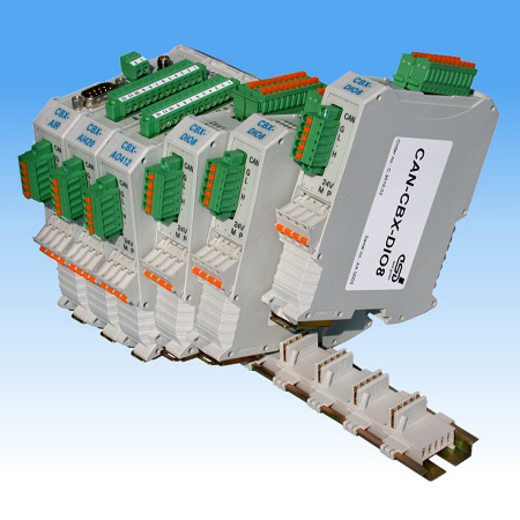 The CAN-CBX module series with InRailBus provides industry compatible CANopen modules in combination with service-friendly ‘wiring’ of CAN bus and supply voltage. The power supply and the CAN bus signals can be applied either via the InRailBus connector (TBUS-connector) integrated in the mounting rail or separately via the clamp connection. Individual modules can be removed from the InRailBus without interrupting the network signals. The CAN interface is designed according to ISO11898-2 with electrical isolation and bit rates of up to 1 Mbit/s. The CANopen-node number and the CAN-bit rate can be easily set via coding switches. LEDs show the I/O-channel state and the CANopen node state. The modules come with CANopen firmware according to CiA 301 and with a CANopen I/O-profile according to CiA 4xx. For more information about esd electronics products please visit the website.